I think it is fair to say Arsenal star Mesut Ozil has his fair share of critics. The playmaker of Turkish origin has made it clear that he does not take notice of his haters and that the only people he listens to is the manager Unai Emery and his ‘inner circle. The 30-year-old said he really is not bothered about what others have to say about him. Ozil told the Daily Mail of his detractors: “Look, I know there’s people out there that like me, there are also people who don’t like me. Ozil also warned his teammates ahead of the Europa League clash against Sporting Lisbon on Thursday not to underestimate the opposition. The Arsenal ace underlined that just because the team is in good form now does not mean he will stop working. The Gunners have gone 14 games unbeaten in all competitions winning 12 of those matches. Ozil added the following ahead of the Europa League Match Day 4 game: “Personally, things are going well but that doesn’t mean I stop working. “The most important thing is that the team is going well at the moment. But it’s a process – every coach has a different strategy or philosophy and we can feel it. “It’s a tactical thing with the new coach. We are learning from him, we are trying to give our best on the pitch every day and every hour. “But we have to keep being hungry, and keep progressing. It’s not like we are done now. It’s like we are just starting. Ozil was rested against Sporting Lisbon for the Match Day 3 clash but is part of the squad leading up to the game tonight. 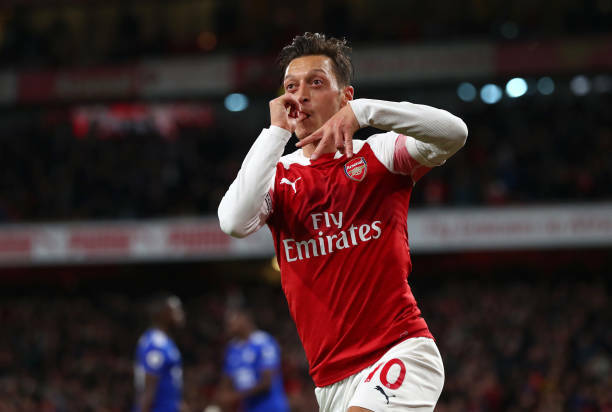 The playmaker is expected to be part of the matchday squad but may get rested again ahead of the Premier League game against Wolves at the Emirates on Sunday.